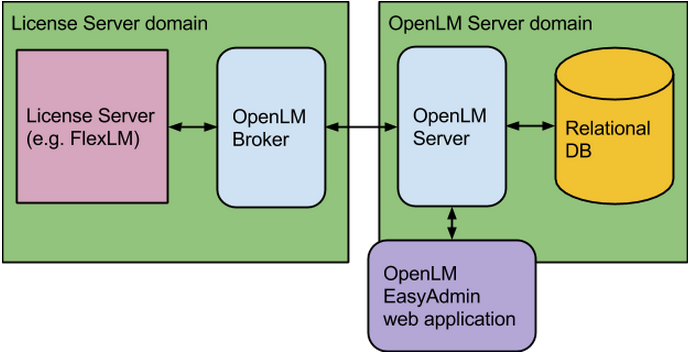 The OpenLM software provides a comprehensive license monitoring and management solution for a variety of license servers, e.g. FlexLM, Sentinel RMS, DSLS etc. OpenLM provides productivity tools for system administrators, Software Asset Managers, and end users. Software as a Service (abbreviated SaaS) is a software licensing and delivery model in which the software is remotely hosted and licensed upon subscription. Organizations turn to SaaS in order to outsource hardware and software maintenance and reduce IT costs. OpenLM has implemented OpenLM SaaS following this trend, enabling organizations to implement their systems with minimal installation and maintenance efforts. As demonstrated in the image above, the OpenLM SaaS system has a single entry point – the OpenLM SaaS manager (red block). The SaaS manager validates and directs data from the license servers via the OpenLM Servers’ layer to the Data layer. The Data layer consists of client – dedicated relational DBs. The OpenLM Servers’ layer and Data layer are secured from external access and therefore not vulnerable to attacks. This layer consists of multiple OpenLM Servers that execute requested Database queries as generated by the client. The OpenLM Servers act as slaves to the SaaS management layer and perform database queries by accessing the appropriate customer database. The multitude of OpenLM Servers in this layer serves to accommodate simultaneous data flow to and from multiple customers. Facilitate on-premise to cloud based implementation and vice-versa. When implementing a SaaS configuration, the OpenLM Servers’ do not directly query the customers’ License Servers for data usage information. Instead – it is the OpenLM Broker that does so. This is the only required installation on the customers’ network. Also access to the communication port used by the OpenLM Broker (default 7016) needs to be enabled by network security (firewall access). At the time of wiring this document (Dec 2014), the current SaaS version does not provide the functionality of the OpenLM Agent. Rather than installing OpenLM on the organization’s network and dealing with Database backup and integrity, OpenLM now offers a light-weight installation procedure for monitoring your valuable floating licenses. Please contact the OpenLM support team in order to register to the SaaS Service.